Many of the 220,000 young Britons who were unable to gain a place at university this year have decided to opt for taking philanthropic volunteering breaks in developing countries instead, according to the world’s largest commercial volunteer organisation, Projects Abroad. “There has been a significant rise in the number of students coming to us to volunteer this year,” says Dr Peter Slowe, managing director of Projects Abroad and former economic policy advisor to Tony Blair. Since being founded in 1992, Projects Abroad has sent more than 35,000 volunteers to 27 different countries on five continents, at a rate now of over 8,000 a year. Although the volunteers range in age from 16 to 75, the majority are students taking time out for a gap year, choosing from a variety of placements in diverse fields from conservation to human rights, archaeology to child care and even taking part in missions to rescue child slaves. Dr Slowe said early indications are that Projects Abroad’s volunteer placements are up around 30% this year, and according to figures from youth specialist travel agents, STA, there has been an overall surge of 35% in the number of students booking gap year travel experiences, and a rise of 28% in those opting for “mini-gaps” (also known as “snap years”). Dr Slowe puts this phenomenon down to a combination of events: Firstly there was a record level of university passes at A-level this year, resulting in 700,000 applicants vying for 480,000 places. This has left the tens of thousands who failed to make it wondering what to do instead, in a time of record levels of youth unemployment. Then, with the prospect of university fee increases coming into effect in 2012, many students who were planning to take sabbaticals decided they should do so now, before facing a heavy financial burden. He said he believes that Projects Abroad will continue to see a growth in the number of youngsters volunteering not only because of the diversity of its opportunities, but because the organisation caters well for “snap years”, offering short stints which can be fitted in to university or college holiday periods. 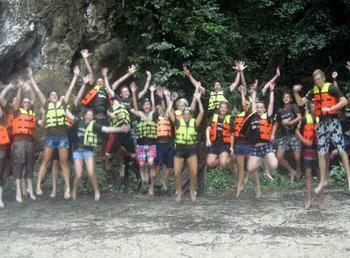 To find out more about volunteering opportunities abroad for all ages and stages, visit www.projects-abroad.co.uk.